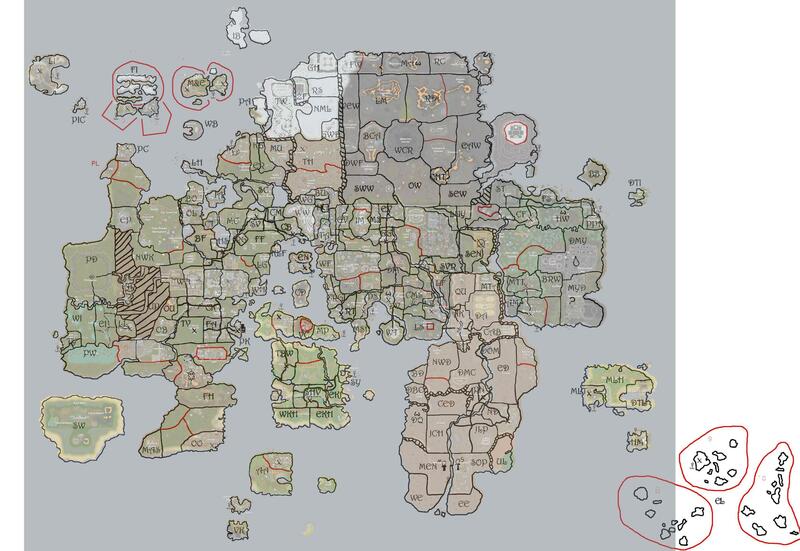 Ideally, we could call it "West Varrock Territory", and call the city of Varrock "Varrock City"/"Varrock Actual." That way, you know close enough where it is, and you're not reminded of the Westboro Baptist Church. Oh, sorry. I'll upload a map in a bit. All of that stuff is proposed, not final ;~; I just wanted to see if that looked good at all based on what you guys were saying. It's harder to grasp when I can't see the map! Do upload it. For Yanille, I'm not to happy with the fact that Yanille Outskirts completely Encompasses Yanille, maybe split the outskirts into two territories? That's excellent. I'd still chop it up a little bit, like slicing up the Wilderness for more territories. The territories there are really big and could easily house more. That is, if we can figure out names for them. Let's see... there could be two new regions in the desert, outside the cities of Menaphos and Sophanem. Soul Wars island could be separated into arena and lobby, Crash Island can be its own territory, Southern Wilderness could be split into two somehow, just for the heck of it (preferably into south and north regions), The area north of Darkmeyer should be separated from Darkmeyer itself and Western Wilderness can be split into three (Ruins, forgotten cemetery, North-western Wilderness). That's it, can't imagine the map getting any more split. Excellent work! Click here for New Map! Just a few more contentions! 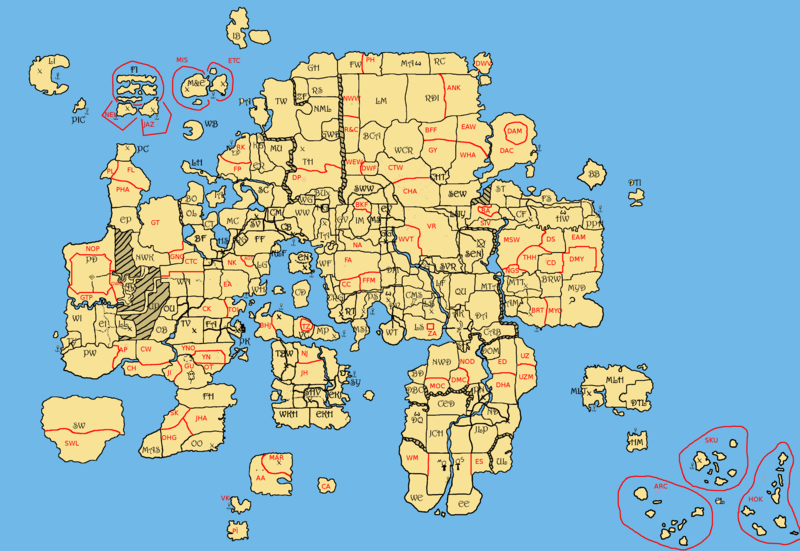 The Eastern Wilderness, Lava Maze, Dark Warrior's Fortress, Eastern Desert, and Desert Mining Camp regions should be split up. Void Knight Island and Pest Island should be different. Split off Drakan's Castle from Darkmeyer. That's everything I want to change with the map. At this rate, Siroki might replace Yuccon as The Cartographer. Good stuff! I'd say Darkmeyer, EAW, Priffdinas, and ED are still a bit large. I still think we should split Priffdinnas into four, in order to give more room for the Seren Faction. Or we could just put a bunch of areas in the mountains. Ideally both. Seren's really cramped. Not 4, not when other major cities have 1, maybe 2 new outlying regions. So, I say 2. Maybe the Prifdinnas Undercity could be a Seperate City from Prifdinnas Actual? They have this Undercity, don't they? It has this Library, I think. 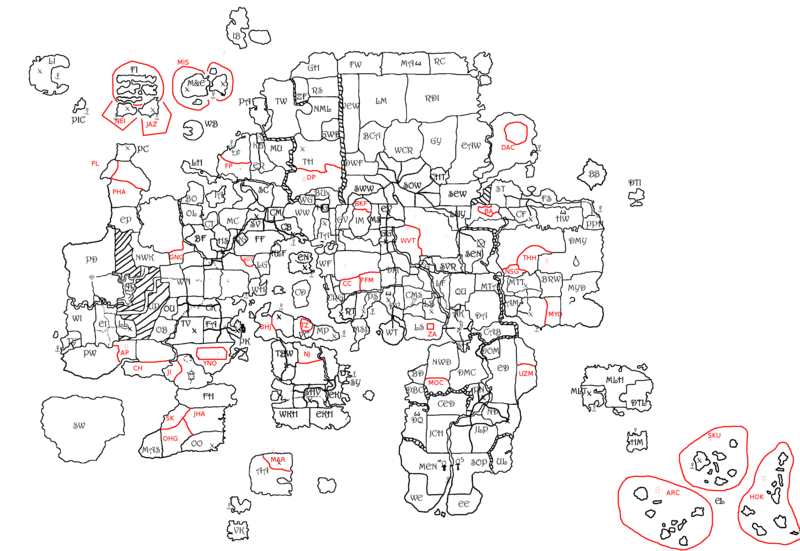 JUST DRAW ARBITRARY LINES ON THE MAP WITH THE TERRITORIES YOU DON'T EVEN KNOW WHAT TO DO WITH LOL. 1. Daemonhiem is in the same position Yanille was in: Make a North Region and a south region surrounding it. 2. I think you already split up the eastern Desert. 3. The Grand Tree can be split up some: Split it up into the Grand Tree Region, the East Gnome Stronghold Region, and the West Gnome Stronghold region. The Lava Maze is really only a third of the size of the designated Lava Maze Territory. Ideally, we could make the Lava Maze Territory, the Deep Wilderness Mine, and the Deadland Territory out of it. Omg that's a weird conglomeration of letters. As for Daemoneheim... I changed it from a circle to a line. PROBLEM SOLVED.